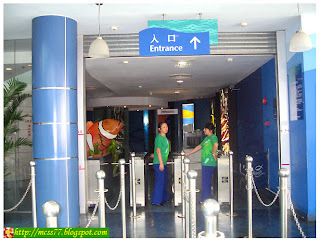 Near the base of the Oriental TV Tower is the Shanghai Ocean Aquarium where we paid a visit. 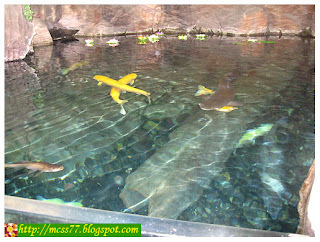 The Aquarium has a total built in area of 20,500 square meters. 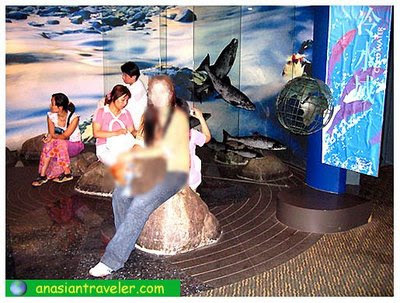 It is made up of 9 different thematic zones such as China, South America, Australia, Southeast Asia, Coldwater, Antartic, Sea & Shore and Ocean zone. 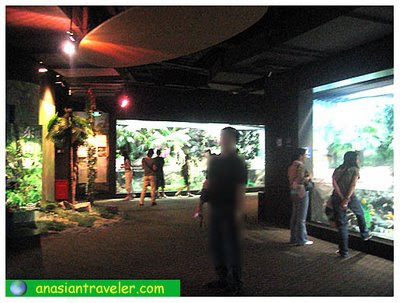 It has a collection of more than 450 species of aquatic animals from all over the world. 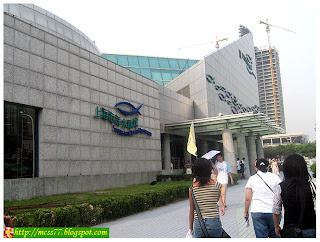 Shanghai Ocean Aquarium is currently the only aquarium in the world to have a separate exhibition zone that showcases aquatic animals from China, particularly rare and precious species from the famous Yangtze River. 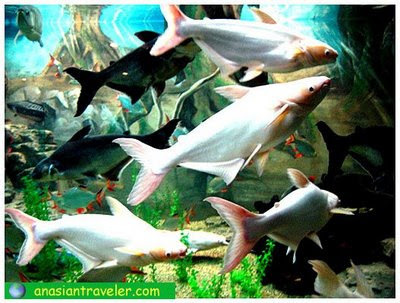 This area has an open pool packed of different kinds of fish. Some of the aquatic species displayed here are the Chinese Soft-shell turtle, commonly found in Yangtze River and breath by using lungs. It is very shy and prefers to hide or dig into a soft substance underwater and leaves just the nose exposed. It digs a hole and hibernates in the mud at the bottom from October to May, when temperatures drop below 15C. The reason why the Chinese Soft-shell Turtle becomes albino is that its skin pigment cells malanocytes in the body fail to produce the melanin which is responsible for producing pigment or coloration of its skin and eyes. 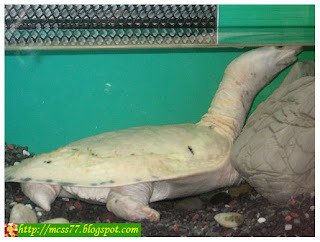 This albino variety is very rare and this particular reptile comes from Dong Ting Lake. 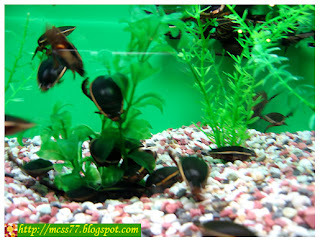 The Water Beetle is an aquatic insect that is commonly found in streams, ponds, and paddy fields. 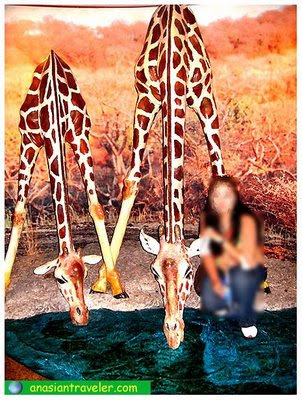 It is distinguished by having protruding eyes and flat legs. It feeds by injecting a poisonous liquid into prey. 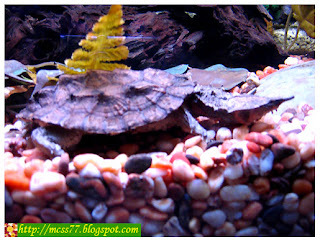 The Matamata Turtle (Chelus Fembreatus) inhabits dark still water. Its body color resembles dead leaves and it can grow up to 45 cm. in length. Its back is usually covered with algae which serve as a camouflage. 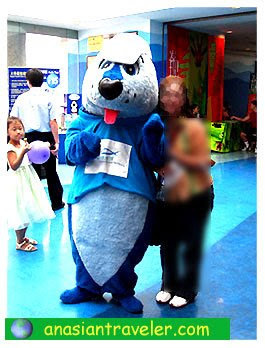 There's a huge printed placard about the Legend of the Baiji Dolphin, a freshwater dolphin found only in the Yangtze River. 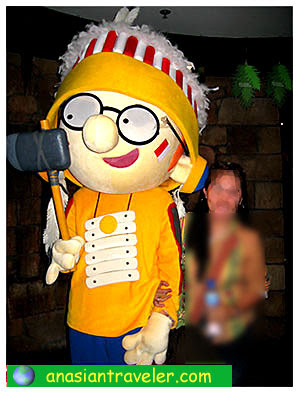 Then we met this mascot on our way to the Amazon Zone. 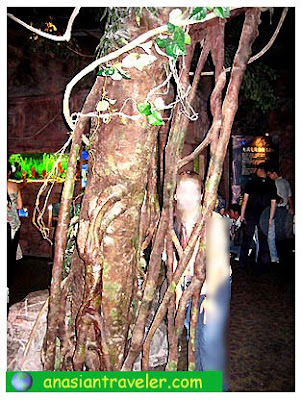 The Amazon Zone is surrounded by tropical rain forest and it contains some of the world's largest aquatic animals. 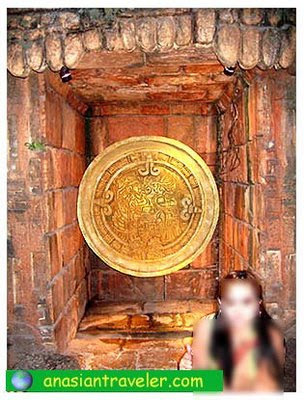 This one looks like an Indiana Jones theme and it produces and vaporizes a jet of dense white smoke. 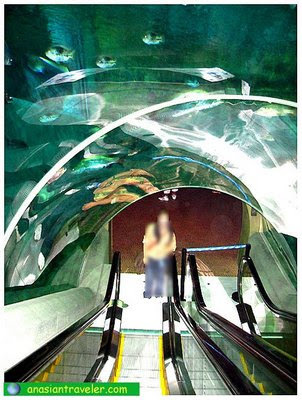 We went downstairs by a double escalator with a huge glass tank full of fish on top. 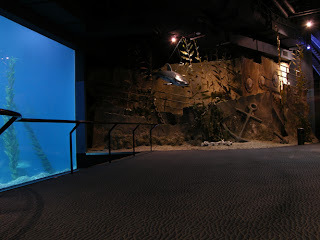 On the lower ground are chains of landscaped water-filled enclosure. 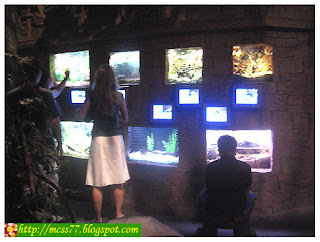 There are also series of mini aquarium that looks like miniature TVs if viewed from afar. 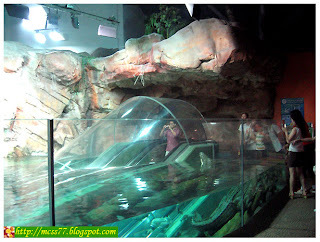 The Coldwater Zone is made up of one single display tank that houses spotted seals. There's the Antartic Zone where you''ll find the cuddly penguins. 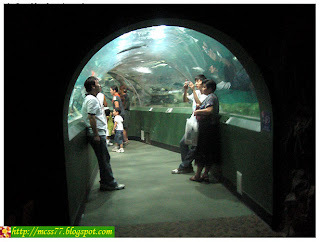 There are series of observation tunnels in the aquarium. 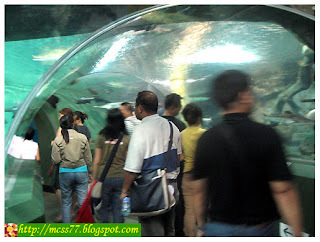 One of the showpiece is the massive 120-meter long glass-surround tunnel, the longest underwater viewing tunnel in Asia. 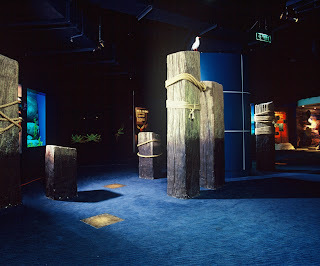 The Marine Zone display a variety of marine species. 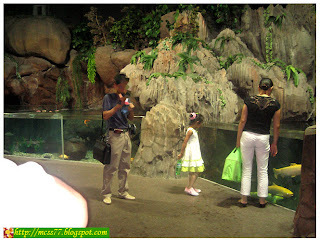 You will find here the Horeseshoe Crab, Sea dragons, Japanese Spider Crabs and the seahorse etc. 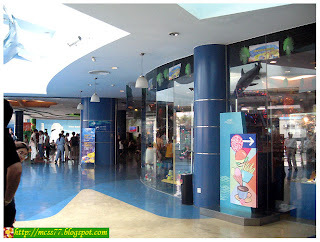 We passed by "The Marine Room", a souvenir shop located after at the end of the oceanarium. It has wide variety of merchandise ranging from ceramics, crystals, soft toys, home accessories, stationery and apparels. Then I met Mr. SOA the mascot while roaming around the vicinity. 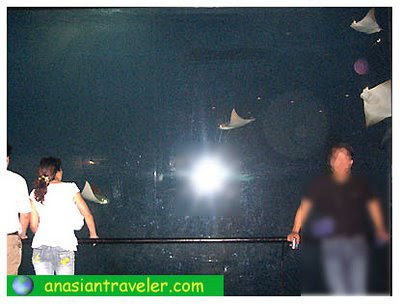 Shanghai Ocean Aquarium is located at No. 1388 Lujiazui Ring Road, Pudong New Area (near the Oriental Pearl Tower). 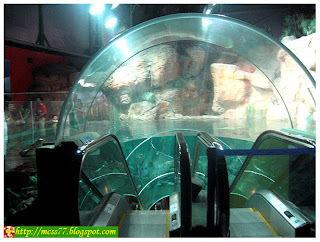 You can get to Shanghai Ocean Aquarium by subway, public buses, taxi and Bund Tourist Tunnel.